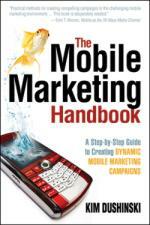 "Practical methods for creating compelling campaigns in the challenging mobile marketing environment. ... This book is desperately needed." Mobile technology not only lets marketers reach customers where they are, it allows them to engage mobile users by targeting their immediate and specific needs. Giving users what they want when they want it is the unique value proposition of mobile marketing, and businesses, agencies, and nonprofits of all types and sizes can create successful campaigns without breaking the bank. In this practical handbook, mobile marketing consultant Kim Dushinski offers easy-to-follow advice for firms that want to interact with mobile users, build stronger customer relationships, reach a virtually unlimited number of prospects, and gain competitive advantage by making the move to mobile now. If your organization wants to reach mobile device users—locally, nationally, or within a specific demographic niche — The Mobile Marketing Handbook will help you put your message in the palms of their hands. Click here to listen to Kim Dushinski's interview at the 2009 Book Expo America revealing how businesses can tap into the power of mobile marketing and build stronger customer relationships.